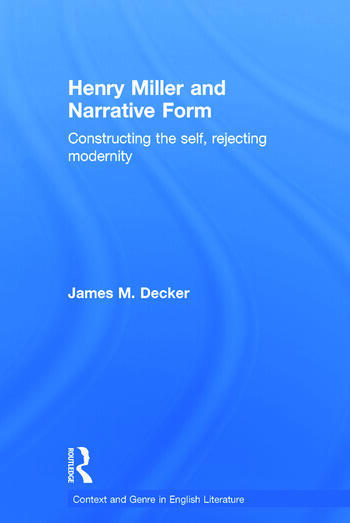 In this bold study James M. Decker argues against the commonly held opinion that Henry Miller’s narratives suffer from ‘formlessness’. He instead positions Miller as a stylistic pioneer, whose place must be assured in the American literary canon. From Moloch to Nexus through such widely-read texts as Tropic of Cancer and Tropic of Capricorn, Decker examines what Miller calls his ‘spiral form’, a radically digressive style that shifts wildly between realism and the fantastic. Drawing on a variety of narratological and critical sources, as well as Miller’s own aesthetic theories, he highlights that this fragmented narrative style formed part of a sustained critique of modern spiritual decay. A deliberate move rather than a compositional weakness, then, Miller’s style finds a wide variety of antecedents in the work of such figures as Nietzsche, Rabelais, Joyce, Bergson and Whitman, and is viewed by Decker as an attempt to chart the journey of the self through the modern city. Henry Miller and Narrative Form affords readers new insights into some of the most challenging writings of the twentieth century and provides a template for understanding the significance of an extraordinary and inventive narrative form.